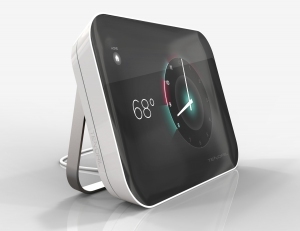 At the same time that energy management startup Tendril announced a partnership and a web-based energy service this week, the company also quietly confirmed with me that it won’t be selling its sleek “Vision” clock-inspired energy dashboard. Tendril CEO Adrian Tuck told me the move to discontinue the product, which was designed by design firm IDEO and was announced a year ago with much fanfare, resulted from research the company did in 2010. Most utilities are not willing to underwrite a $200 energy dashboard product for their customers, explained Tuck. At the same time consumers that would spend $200 on a dashboard for energy management would likely already have bought an iPhone, iPad or high-end Android mobile device, said Tuck. As a result of this finding, Tendril decided to move the Vision functionality to web-services, like its energy service Energize, which it announced this week. Tendril will still sell a low-end energy dashboard, which utilities can use for home energy network deployments in certain areas, but that device has a fixed screen, compared to the dynamic screen planned for the Vision. Tuck says the optimal utility price point for a home energy dashboard is around $50 per device (about a quarter of the cost of what the Vision would have cost). “You can learn a lot from pilots of a certain scale,” said Tuck. Tendril isn’t the first company to come to this conclusion because of economics. Two years ago, GE (s GE) was experimenting with offering a high-end energy management dashboard, but GE’s David McCalpin, general manager for home energy management, explained to me that those devices were looking like they were going to cost close to $1,500. Needless to say, GE ended that project, and revamped its home energy strategy around the Nucleus, a barebones, wireless communication device that still will cost between $150 and $200, but acts as a wireless gateway and router, and “the brains” of the smart energy home. Like Tendril is doing, GE is focusing on having users access displayed information largely on the screens that are already in their homes, like cell phones and laptops. The Nucleus can then connect with smart thermostats and appliances in the home. And McCalpin told me that four utilities — Florida Power & Light, Reliant Energy, the Vineyard Energy Project in Martha’s Vineyard, and AEP Columbus — will be offering the Nucleus to customers, while GE is supposed to start selling the Nucleus directly to consumers in 2011. The move away from high-end energy dashboards was something that the folks from OPower have predicted for a while. Instead of starting from the high-end and via devices into the home energy market, OPower has focused on software, behavioral science and mailed utility bills. The trend also could spell trouble for companies that are laser-focused on the high-end home energy device market, like EnergyHub, which launched the next-generation of its devices at Distributech this week. There could still be a market for high-end home energy devices via the home automation market. When home owners are revamping their houses and building in sophisticated home automation services that combine digital media and entertainment management, home security and home energy, consumers could be willing to pay a little more for a slick device. But a really high-end home energy device doesn’t seem like it can stand on its own. GE execs and telcos like Verizon (s vz) have put it to me that consumers won’t embrace home energy management unless it’s bundled with these other services. Utilities will focus just on energy, but utilities aren’t willing to spend anything. The gap means the end of the stand-along high-end home energy device. Utilities are regulated entities. They should be required to provide detailed, accurate and convenient means for their customers to monitor their use of their product. In the long term, it’s good for the consumer, the industry, and the planet. Regulators should determine the minimum level of service for monitoring and let the utilities pick gear that meets the standard. But hey.. back in January 2010 it wasn’t obvious what an impact tablets would have, thus the decision to build a $600 single purpose device. And now, in 2011 to pull the plug on it. Oh the dollars wasted. Energy usage information and devices for consumers must not only be free, but somehow you’d have to incentivize people to even bother with it. I guess the master plan here is for some little outfit to lobby the public utility commission into forcing us to buy this stuff indirectly through taxes and usage fees? ouch. Katie â€“The UK energy management start-up perspective is that we’ve been pushed to hit mass market price points on all consumer interfaces by virtue of the fact that we operate in the most competitive energy market in the world. Adrianâ€™s proposed target price break point is spot-on and weâ€™ve been working to that pricing zone for years. A great follow-up article would be forecasting a realistic timeline for a US HAN that will support a B2C â€œBest Buyâ€ high street purchasing and commissioning model. Getting US utilities to switch their HAN on is one thing but getting it to work is another altogether altogether! Many thanks. Very enlightening, Katie. Much ado has been made about the consumer’s proclivity to actively engage in their own ‘power monitoring’. Maybe it needs to be free for them to do it? @Rich, sorry, â€œUtilities will focus just on energy, but utilities areN’T willing to spend anything.â€ typo. I will correct it. “Utilities will focus just on energy, but utilities are willing to spend anything.” Please explain.